Why is Carmina Burana so popular? Perhaps it is the simple, repeated melodies, and the insistent rhythms. It is also the connection between past and present, the yanking of early medieval poetry into the present day and the universality of the human experience that we discovered in the process. 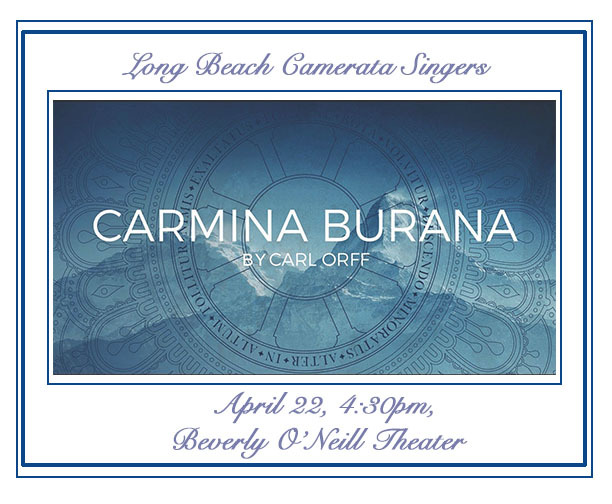 Here’s a little background on the composer and the piece in advance of Long Beach Camerata Singers’ April 22 performance. 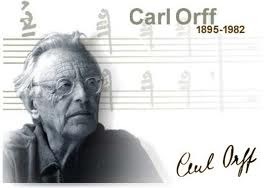 Carl Orff (1895-1982) was a German composer known mainly for his cantata Carmina Burana and his large contribution to music education. 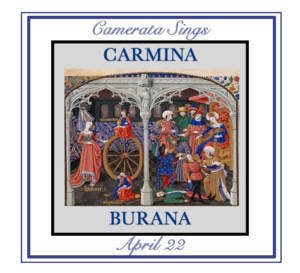 While Orff was not the most prolific composer of his time, Carmina Burana would become one of the most celebrated and performed works in recent history. In 1934, during the approach of World War II, Orff happened upon an 1847 edition of a manuscript entitled Carmina Burana (Latin for Songs of Beuern) by Johann Andreas Schmeller which consists of medieval poetry and satirical texts that were written in Latin and German by a group of nomadic, defrocked clergy known as the “Goliards.” The contents of the manuscript were filled with dramatic texts depicting nature, love, lust, and above all, fate and fortune. Orff embraced this literature and recognized an opportunity to create a large-scale work which would become the famed Carmina Burana, subtitled “Cantiones profanae” (profane songs), a staged cantata for orchestra, chorus, soloists, and dance ad libitum. The work was composed in 1936 and premiered in Frankfurt on June 8, 1937. The work is divided into three main sections, framed by an opening and concluding chorus in praise of Fortuna, the goddess of fate. In the first section entitled ‘Primo vere’ [In Springtime] the arrival of spring with its sunshine and fresh breezes awakens the whole world with new life. In ‘Uf dem Anger’ [On the Green] the village boys and girls, in particular, respond with quickening desire to the enticements of courtship and dance. The question is left open: how best to find love in this season in which everything seems to be bursting anew? In second section, ‘In taberna’ [In the Tavern], the men sit deep in their cups, rather oblivious to the springtime that is unfolding around them. A baritone sings with bitter pathos about the ruin he has made of his life and in a grotesque parody, a tenor sings the dying lament of a Swan being roasted on a spit. It is a fool’s paradise and a singer proclaims himself the Abbot of all this folly. The men are inebriated and sing rousing choruses calling for the entire world to join them in their toasts to dissipation. In the final section, ‘Cour d’Amours’ [The Court of Love] the power of love prevails. It proves irresistible as Cupid, the God of Love, is said to fly everywhere. “Young men and women/ are rightly coupled.” In a joyful climax a young woman submits to the power of her lover’s full embrace and the chorus sings a final hymn to Venus, the Goddess of Love. After its successful premiere in Frankfurt, Orff said to his publisher: “Everything I have written to date, and which you have, unfortunately, printed, can be destroyed. 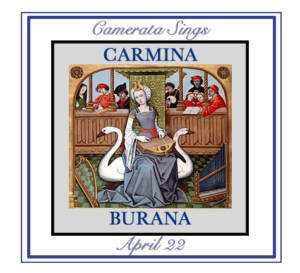 With Carmina Burana, my collected works begin.” Orff lived long enough to see Carmina Burana become one of the most recognized works in the anthology of choral repertoire. And though he had originally scored this cantata for full orchestra and chorus, in a display of shrewdness and savvy, he also approved for the arrangement of the work for chorus, soloists, two pianos, and percussion to allow smaller ensembles the opportunity to perform the piece. Recognition to Joseph Kim for his illuminating program notes, from which this post is largely derived.